Netizens are condemning a male driver caught on video threatening a female driver with a machete after he drove against the traffic to cut in front of her car. 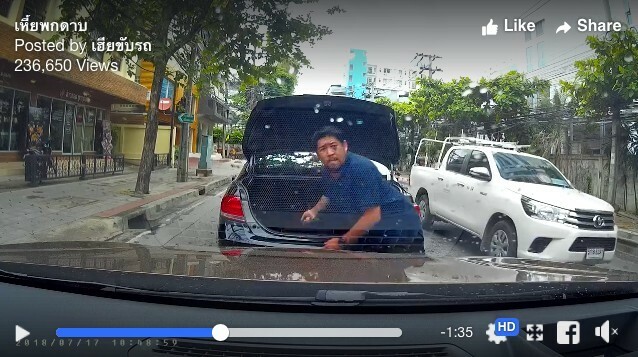 According to the date stamped on the clip by the woman’s dashboard camera, the incident took place yesterday (Tuesday) at 10am on a Bangkok road with two lanes on each side. The clip was first posted on YouTube by a woman, who has withheld her identity, explaining only that the woman driver was a friend of her mother’s and that she had filed a complaint with police. The man finally managed to complete the illegal overtaking manoeuvre after they drove through an intersection. He then stopped his car, exited, opened the trunk and pulled out the large knife. The dash board video shows him walking towards the woman’s car before he disappears from shot. The person who posted the YouTube clip said he then tried to open the door before giving up, walking back to his car and driving off.